look at your business from the outside-in, empathize with and know your customers, understand customer perceptions and needs as well as needs of all stakeholders. Work towards satisfying them. create new market niches and customers by inventing new-to-the-world products, mastering radical innovation, venture strategies, competitive strategies and differentiation strategies. Operational Excellence: Although cost-cutting efforts can build your bottom line, they cannot fuel high growth; they cannot increase top-line revenue. Venture Strategies: It is radical innovation and new game changing breakthroughs that will launch your company into new markets, make you a market leader, enable rapid growth, and create high return on investment. 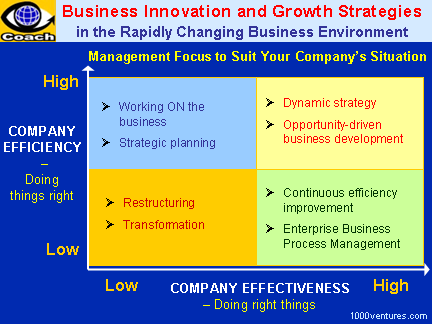 Gaining market share through low cost – high productivity growth, rapid cycle time, high asset turnover. 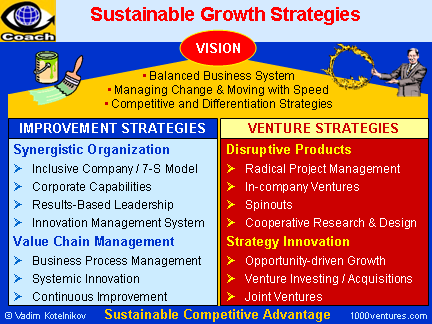 Sustainable business growth strategy is a practical approach to achieving top-line growth and bottom-line results. Shaping culture, especially when it comes to creating a culture of innovation, is a daily task that involves elevating the mundane to the strategic. The service-profit chain is a powerful phenomenon that stresses the importance of people – both employees and customers – and how linking them can leverage corporate performance. Creating a work environment that encourages rapid response to customers' needs and attentive follow-through is the key to leveraging the power of the service-profit chain. This is only possible when people are empowered to make decisions and are motivated to solve problems.